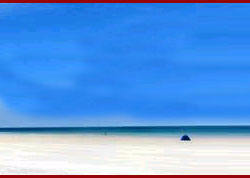 Tourist Attractions : The National Oceanography, The Cabo Raj Niwas, Reis Magos Church, the Salim Ali Bird Sanctuary. Beach Activities : Windsurfing, parasailing, water-skiing, toboggan ski-biscuit, skibob, sports fishing, snorkeling, harpoon fishing, kayaking, and yachting. Water-scooter, cycle, and motorboat rides. Dona Paula is 7 km from Panaji near the rocky point between the Mandovi and the Zuari is Dona Paula, a secluded bay with a fine view of the Marmagao harbour.This is an idyllic spot to relax and sunbathe. Water scootering facilities available. On the northern banks of the River Zuari, a little away to tie south east of Cabo, lies a large escarpment with a bay and two small beaches which in the olden days was part of Oddavel. At the place where two of Goa's famous rivers meet the Arabian sea is the Dona Paula bay. Named after Dona Paula de Menezes, this place is called the Lovers Paradise due to a myth which has been attached to this place. 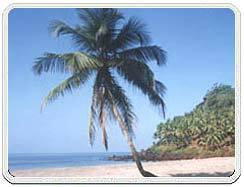 At the place where two of Goa's famous rivers meet the Arabian sea is the Dona Paula bay. Named after Dona Paula de Menezes, this place is called the Lovers Paradise due to a myth which has been attached to this place. A Love Story Named after Dona Paula de Menezes, this place is called the Lovers Paradise due to a myth that has been attached to this place. According one legend the Viceroy's daughter after facing objections from her family about her love affair with a poor fisherman jumped of the cliff. Another legend says that punished for captivating Francisco de Tavora, the Count of Alvor with her charm the Viceroy's daughter was pushed off a cliff to drown in the waters below. Her irrepressible spirit still continues to haunt every visitor with legends of her lovers. She is even supposed to have been seen emerging from moonlit waves wearing only a pearl necklace. Water Sports Tranquil and blue, Dona Paula unravel the ultimate in aquatic sport and fun.Dona Paula Sports Club, Dona Paula offers some of the best water sports facilities to the sports enthusiasts including Water-scooter rides, Motor-boat rides, etc. Road & By Ferry : Take a bus or motorcycle-taxi from Panjim or the ferry service from Marmagao. Buses to Miramar & Dona Paula leave every fifteen minutes from Panjim's Kadamba Bus Stand. One can also pick them up from the steamer jetty, and at various points along the waterfront. The National Oceanography : Established in the year 1960s, the National Oceanography Institute deals with marine biology and all the major branches of coastal and marine oceanography. The major attraction of the institute is its Marine Biology Museum and Taxonomy Reference Center. The Cabo Raj Niwas (the Governor's House) is at distance of half kilometer from the National Oceanography Institute. It has the tomb of Dona Paula de Menezes in the Cabo Chapel. 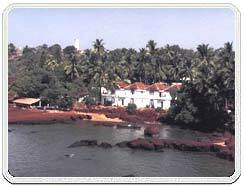 The Raj Bhawan offers an excellent view of the nearby coastline and the Aguada Fort. Beach Activities Water sport facilities are the key attraction of this beach. The Dona Paula Sports Club provides water-scooter, cycle, and motorboat rides. Other water sports include windsurfing, parasailing, water-skiing, toboggan ski-biscuit, skibob, sports fishing, snorkeling, harpoon fishing, kayaking, and yachting.